in Kuwait in partnership with ATC (Advanced Technology Company K.S.C.) who represents GE PACS/RIS and modalities in the region. 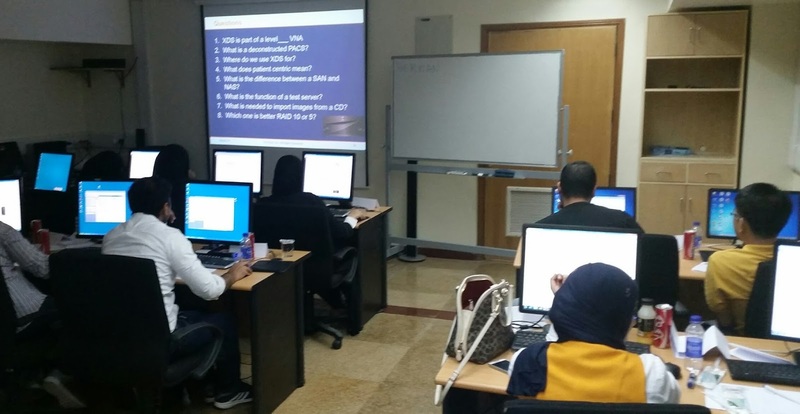 These five day intensive and advanced training sessions teaches hands-on skills that includes DICOM and HL7 troubleshooting and advanced PACS topics to prepare these professionals for new upcoming developments such as cross-enterprise image and information exchange, and new IHE profiles to facilitate these. We go as detailed as looking at real-life interface transactions using state-of-the-art tools and simulators that represents a “virtual hospital”. After this training, these professionals will be well equipped to support the new and upcoming healthcare imaging and IT software applications. OTech is a well-known PACS training company that has trained literally thousands of professionals in many regions around the world both through face-to-face and on-line training and has published several textbooks and study guides on this subject for more information, see www.otechimg.com. This training is of a big importance for Ministry of Health (MOH). Those people should be extremely happy that they have a stroke of luck to attend training seminars held by OTech that has trained professionals around the world. Professional at http://pimion.com, Thomas Clein. The academic ghostwriting is all about writing with more powerful thinking just like writers. You should write like professional to get maximum benefits. I like to visit all seminars, because almost all of them are free and it's a good way for getting some additional knowledge. Choose visit and you won't regret! So many scopes of this course and materials and its designed to help expands the careers opportunities of the attendees in the area of PACS administration/management and imaging informatics in general. Online education is providing all attendees with certificates for attendance and achievements, based on their active participations. Those people should be extremely happy that they have a stroke of luck and I suggested to everyone get this course fast degrees online and attend training seminars with professionals trainers and start and grow your career in this field. You talk about Administrator training in Kuwait.I have read your posts and I quite like them. I am interested about academic ghostwriter. As being a writer I know hoe much effort requires in writing a fresh and original piece of blog or critical thinking essay. Nice work done. Appreciate your quality work! Awesome writing, for this time we are learn from it. This is the most instructive article. Education is the best material for a country batter. explore more to see the sample of quality writing services. different training develop different skill of many people . your post provide many valuable information about PACS Administrator training is really informative . keep shearing article like this http://www.statisticaldataanalysis.net/comparative-data-analysis-definition/ if you want to know more about the quality writing services. With thanks considerably with regards to expressing your fabric. Dreamed about have an understanding of a person's conviction along with I'll be longing a good generate. At present observe the following kitchen remodeling near me Continue to keep crafting along with thanks considerably wholly industry.